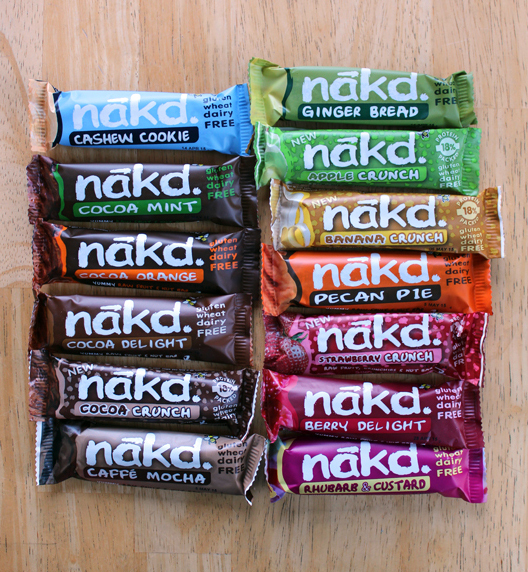 A while back, I got one of these nakd bars in my Vegan Cuts snack box and I loved it! Right away, I went to the Vegan Cuts site and ordered myself a box of mixed flavors and a box of just chocolate flavors. 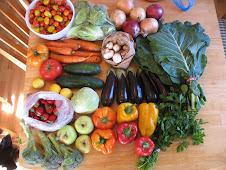 One by one, I ate my way through my stash. But since then, I hadn't seen the nakd bars in stores and was wondering what had become of them. When I got an email recently from Natural Balance Foods offering to send me a box of nakd bars to review, I wrote back immediately! You can't sit around on an offer like that, ha ha. Evidently nakd bars have been established over in the UK, but are just now making a push in the North American market. It's good new for us, because they're pretty great! It looks like they'll eventually cost a bit more, but right now they have a deal for 13 bars for $9.99. That's a pretty good idea, because it makes it pretty affordable to try them out before you see them at the grocery store, or decide to order more online. They even come in a cute little box. I know that shouldn't necessarily affect my opinion, but it does. I like pretty things. The bars themselves are kinda close to Lara Bars. They're made with really simple ingredients like dates and cashews and raisins. The bars range in calories depending on the flavor, from 130-160 per bar, with 3-4 grams of protein. They also have 4 "Protein Crunch" flavors that include "soya crunchies" - made with non-GMO soy. These bars have 5.5 grams of protein per bar. The bars are fairly petite, but this is actually something that I really like about them. If I want a bar that will really pack a nutrition and calorie punch, I'll probably get a Vega bar or something like that. But, most of the time, I'm just looking for a yummy afternoon nibble that's going to be tasty and satisfying, and not have 300 calories. These adorable little nakd bars are just perfect. It's been a while since I had a Lara bar, so I'm not sure about the direct comparison, but these bars have a more dense (almost chewy) consistency that I find quite pleasurable. I really feel like I'm biting into something when I eat one. Also, I recall that Lara bars had occasional chunks of walnuts or almonds inside them - whereas these bars have a more consistent texture throughout. I like it either way. Also, such fun flavors. I mean, when's the last time you bought yourself a Rhubarb & Custard bar?? It's so good! So far, I really love all of the chocolate flavors. I was thinking of saying "especially the Cocoa Orange one," because it's really good, but I like all the chocolate flavors a lot. I"m not generally big on berry flavored things (except for actual berries), so those two bars will probably be the last to meet their maker. 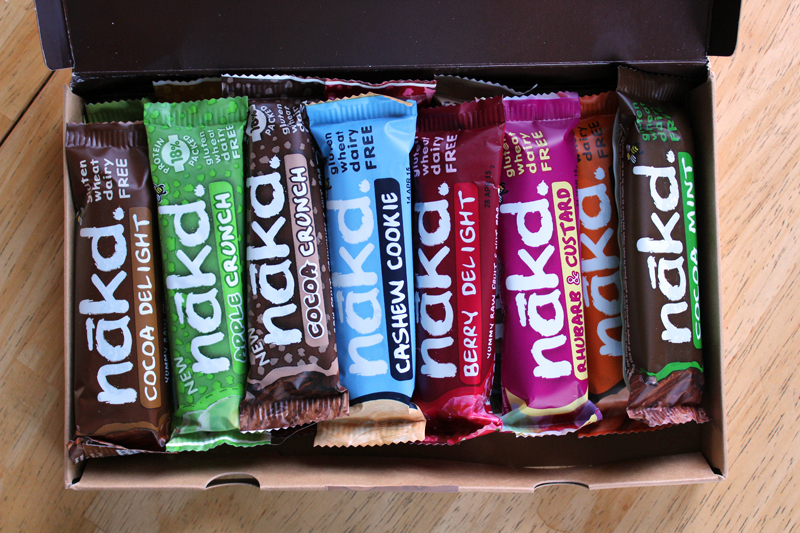 I'm making my way through the box that Nakd sent me, and I'll definitely get myself more when this stash runs out. Having already bought myself two boxes in the past, I know I'm already a fan for sure. Ooh, that rhubarb & custard bar caught my eye immediately. Sounds so good!! And cocoa orange. I think we have the same taste! I hope you get to try some! I don't know if they have those flavors in the US, but I would love to try them - especially Christmas Pudding!! I love Nakd bars, they have been available here for a couple of years. My favourites are the Rhubarb and Custard, Berry Delight and Cashew Cookie. They are such a good little snack! I saw the Bakewell and Pudding flavours on some of the UK blogs, so I hope they will be making their way down under shortly. It's funny, because Cashew Cookie doesn't immediately sound so interesting to me, but everyone is telling me that it's one of their faves. I'll try it next! My mocha one is long since gone, I loved it too! Ha! 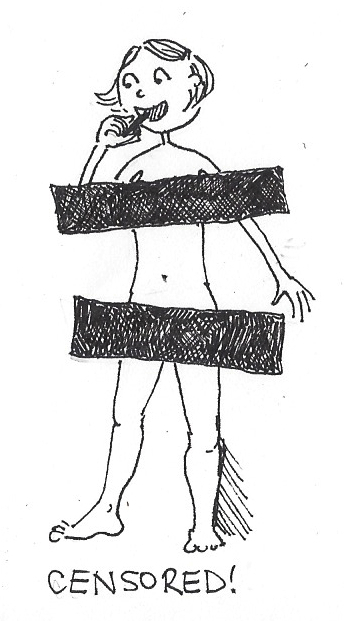 I love your censored picture!